The geomagnetic laboratory is one of the oldest laboratories in the institute. The geomagnetic observations are dated back to the beginning of the 19 century. 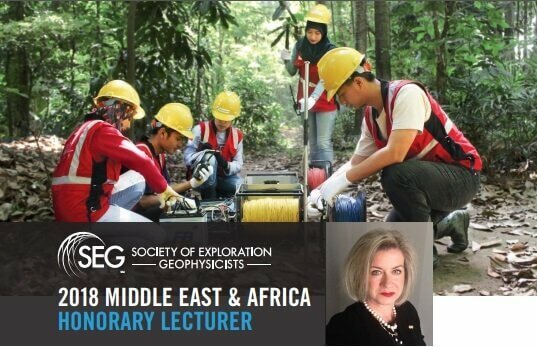 The mission of the geomagnetic laboratory is to serve the Egyptian community by providing access to state-of-the-art laboratory facilities, technical assistance and scientific expertise for research in a wide variety of topics relevant to studies in onshore/offshore magnetic explorations, magnetotelluric, geomagnetic absolute observations, paleomagnetism, rock and mineral magnetism, and other related interdisciplinary fields. 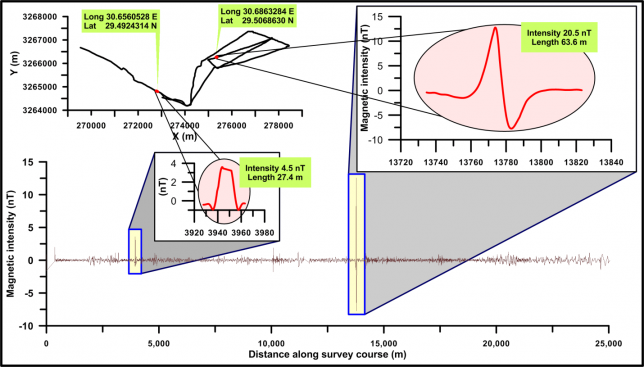 The aim of a magnetic survey is to investigate subsurface geology on the basis of the anomalies in the earth’s magnetic field resulting from the magnetic properties of the underlying rocks. 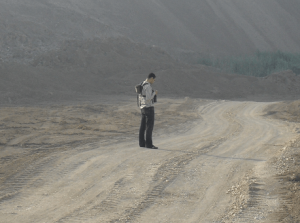 In general, the magnetic content (susceptibility) of rocks is extremely variable depending on the type of rock and the environment it is in. 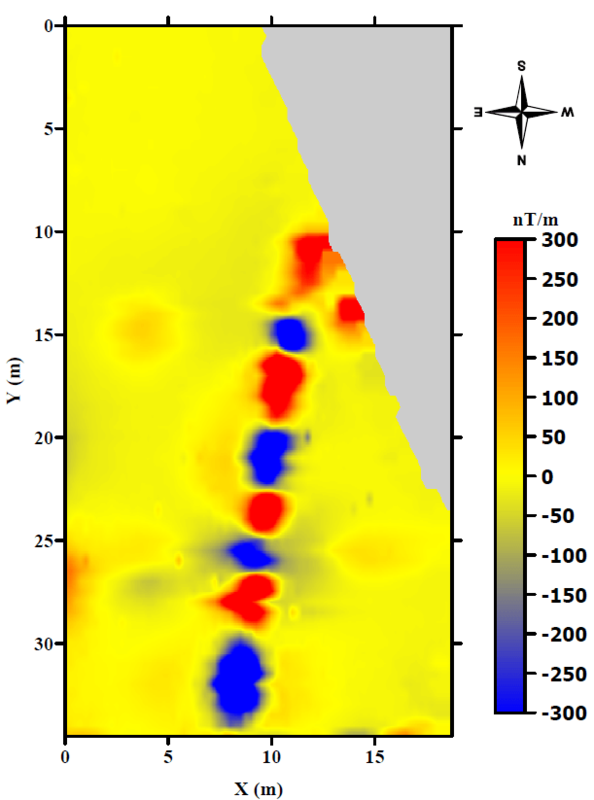 Common causes of magnetic anomalies include dykes, faults and lava flows. Anomalies in the earth’s magnetic field are caused by induced or remanent magnetism. Induced magnetic anomalies are the result of secondary magnetization induced in a ferrous body by the earth’s magnetic field. 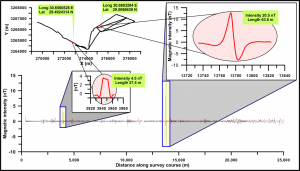 The shape, dimensions, and amplitude of an induced magnetic anomaly is a function of the orientation, geometry, size, depth, and magnetic susceptibility of the body as well as the intensity and inclination of the earth’s magnetic field in the survey area. 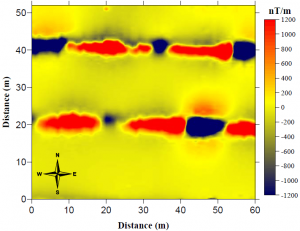 The magnetic method is typically used to map basement relief, faults, and basic igneous intrusions. This can be applied for oil exploration, ground water investigation, geotechnical applications and as a reconnaissance tool for new urban areas. Various maritime survey methods, such as sonar, optical and magnetic technologies, are used for locating submerged artifacts. 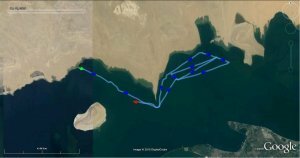 Marine magnetic surveys have been successfully used for mapping marine ferrous targets, contaminated seabed sediments, and archeological structures. 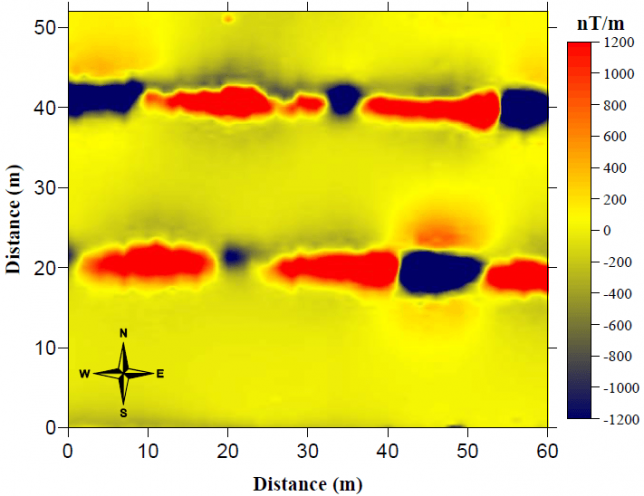 The magnetic method has proved to be the most effective for locating ferro-metallic objects masked by sea floor sediments or buried under the seabed. Because the intensity of the magnetic field produced by a magnetized body drops rapidly as the distance to the measured point increases, tow fish configuration is widely used. Optimal and safe magnetometer altitude over the seabed is maintained by adjusting the depressor wings and/or by placing the cable weights periodically along the length of the tow cable. 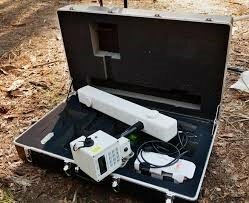 Most modern magnetic surveys are conducted using gradiometers that consist of two or more sensors separated by a fixed distance. 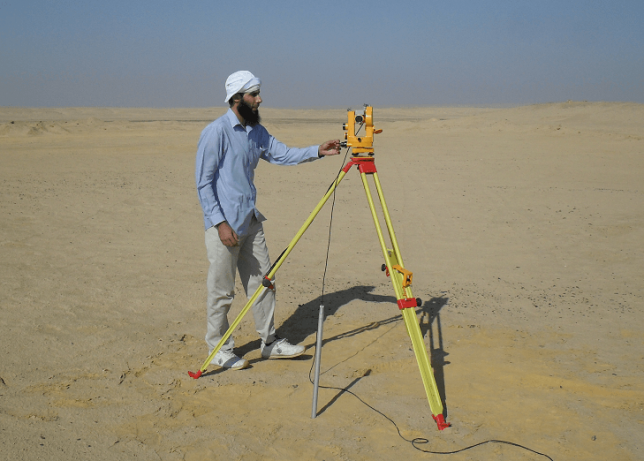 Magnetic survey is one of a number of methods used in archaeological prospection. 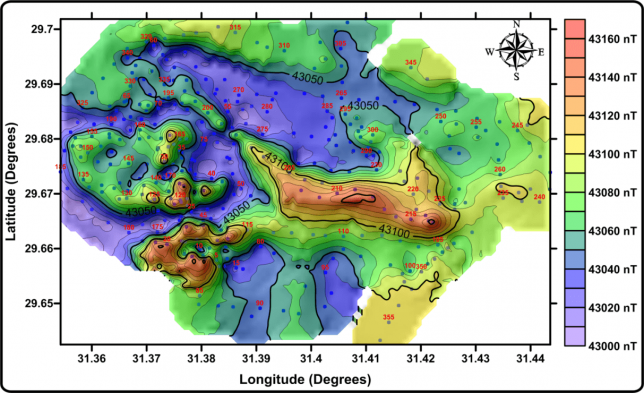 Magnetic surveys record spatial variation in the Earth’s magnetic field. In archaeology, magnetic surveys are used to detect and map archaeological artefacts and features. 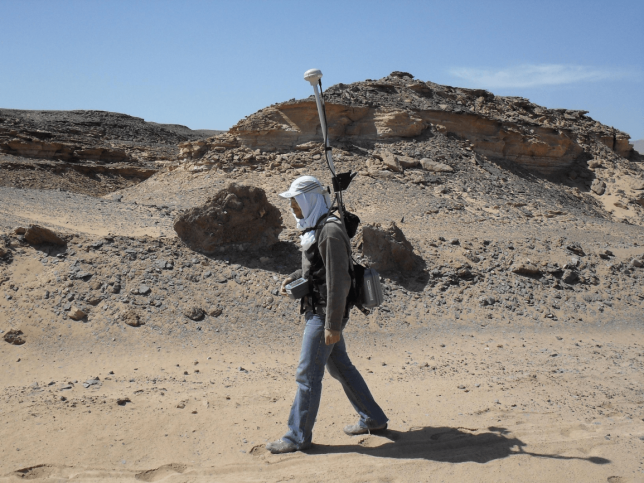 Magnetic surveys are used in both terrestrial and marine archaeology. 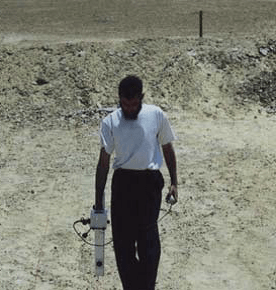 The magnetic method is effective for locating mud bricks, granite, and metallic objects. Moreover, it could detect sealing blocks and shafts in ferruginous sand stone. 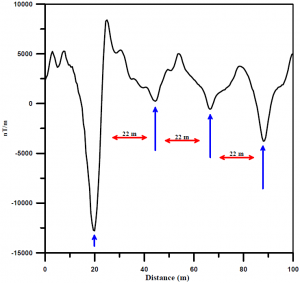 The magnetic measurements is very sensitive to variation in magnetic susceptibility. 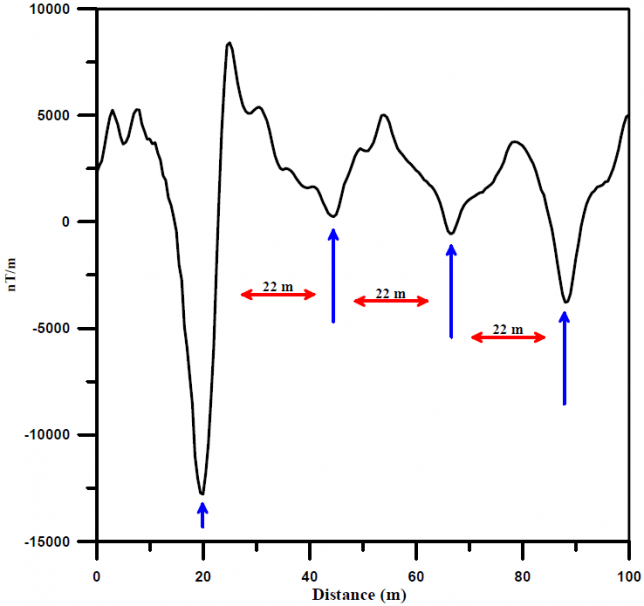 Magnetic Susceptibility is the key to coherent results from magnetic surveys. 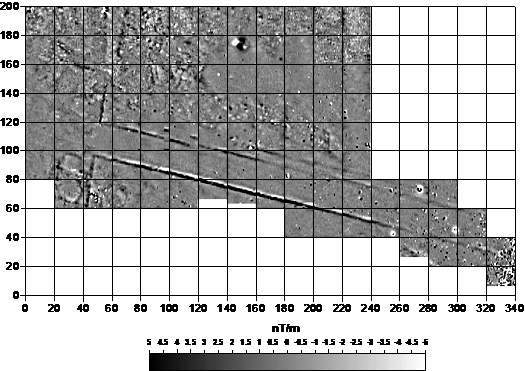 Moreover, not only can the difference in magnetic susceptibility between topsoil and subsoil be used in a predictive manner, but also the spatial variation of susceptibility enhancement throughout the topsoil itself indicates ‘activity’ in the archaeological perspective. 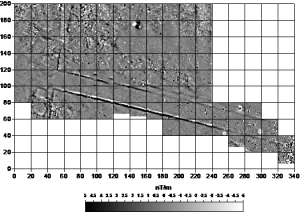 Although the changes in the magnetic field associated with archaeological features are usually weak, changes as small as 0.2 nanoTesla (nT) in an overall field strength of 42,000 nT, can be accurately detected using a dedicated instrument. 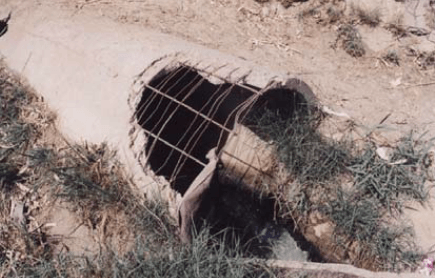 Mapping the anomaly in a systematic manner will allow an estimate of the type of material beneath the ground. 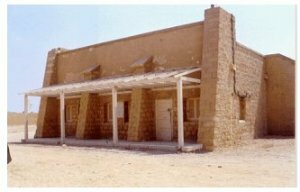 Anomalies that are of interest are the product of relative contrasts between the subsoil and magnetically enhanced archaeological features. 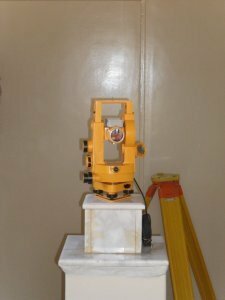 Measurement of the magnetic field direction in term of magnetic declination and inclination. 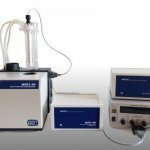 The Absolute measurements are conducted using the DI flux magnetometer with accuracy of few arc seconds. 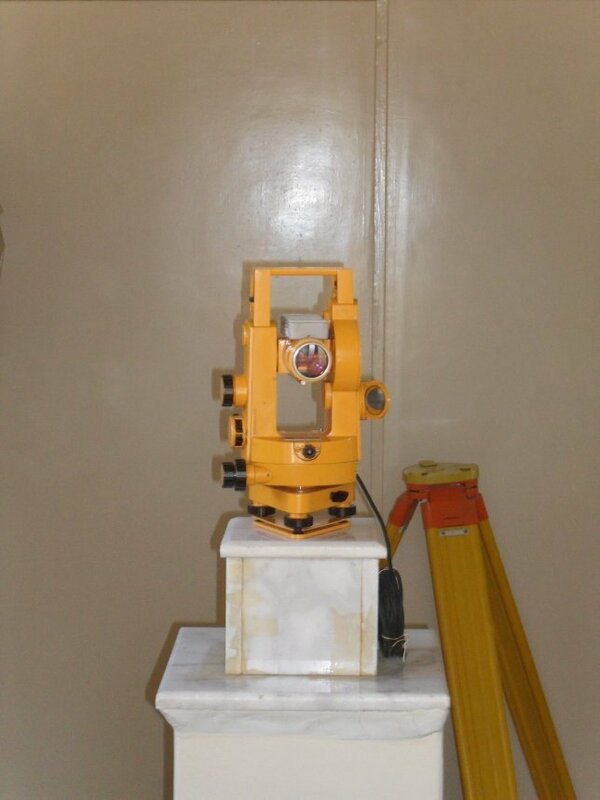 Usually, the magnetic declination is measured for compass bed calibration and normal field measurements. 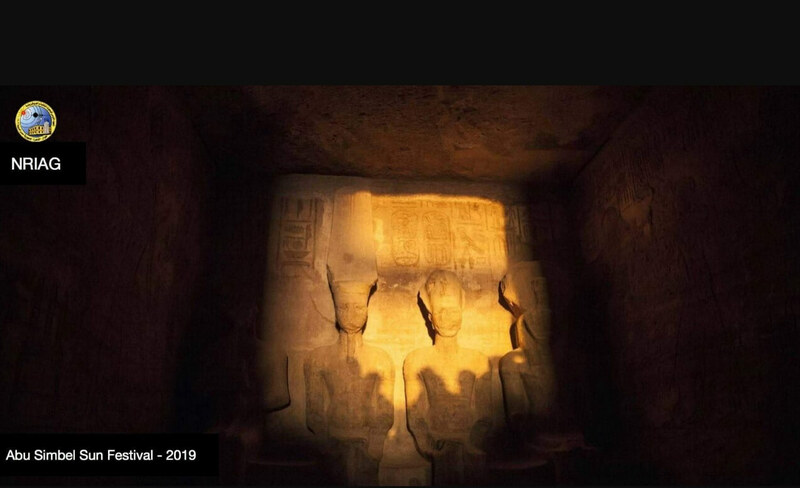 Magnetic activities observed by geomagnetic observatories in Egypt (STDF). 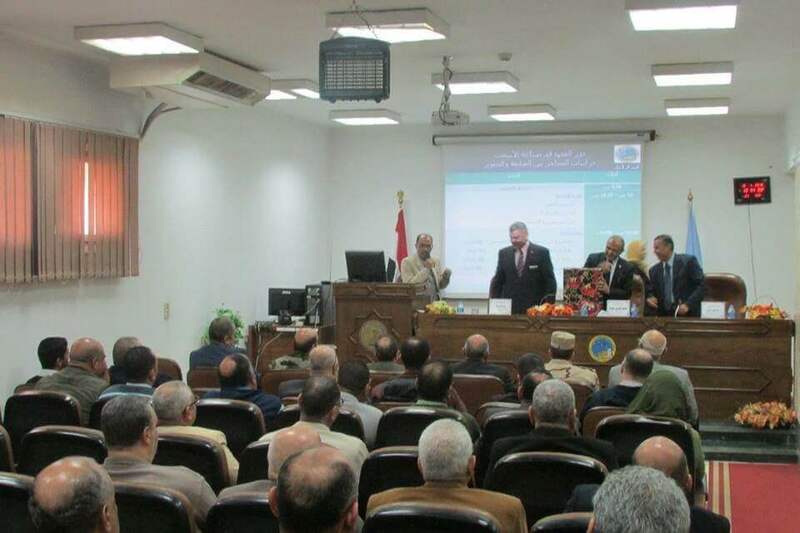 Hazard Assessment Due to Earthquakes in Southern Sinai Peninsula, Extensions Around the Capital Cairo and Suez Canal Areas, Egypt (STDF). Exploration and evaluation of the Manganese, Sulphide and copper ore minerals at Abu Zneima, Wadi Saal and Sarabit El Khadim areas, Southern Sinai Peninsula (STDF). Implementation of the Geosciences to Construct the New Desert Urban, Site Management, and Distribute Resources; Pilot area: Moghra Oasis, Qattara Depression (STDF). 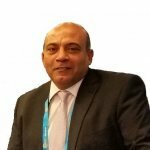 Exploration of Economic Minerals (Gold, Iron &, Copper) using Geophysical Techniques in South Eastern Desert, Egypt; Pilot areas: Eastern part of Aswan and Wadi Allaqi (STDF). Paleomagnetism can focus in studying the behaviour of the past geomagnetic field through several million years ago. This technique can be help in studying the plate tectonic processes and Paleogeographic reconstruction of the earth during the past geological era. 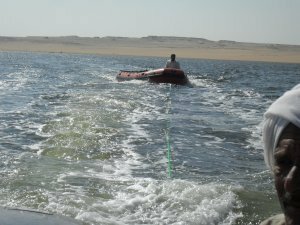 We are working in Egypt and Africa, addressing tectonic problems and review the set of databases for several ages. We have involved in several projects for studying the Paleomagnetism of Cenozoic and Mesozoic volcanic rocks in Egypt. NRIAG has two geomagnetic observatories. 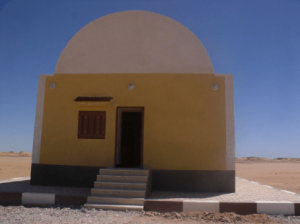 Misallat geomagnetic observatory located 70 km to the south west of Cairo in Faiyum governorate and Abu Simble geomagnetic observatory in Aswan governorate in south Egypt.